If you've ever met, owned, trained, or been trained by a dog, this one's for you, your friends and your relatives! Give it a listen and take a good look at the complex human/dog relationship by identifying with the daily experiences of the working guide dog team! "Guide Dogs, First Hand" is my first recording to be released. It contains 11 songs which address many aspects of living and working with a guide dog, not usually covered in basic brochures. I composed, performed and recorded the music and lyrics in my Santa Cruz studio. This CD has many unique features including sampled recordings of 3 guide dogs. The dogs become one of the instruments and can be heard throughout the CD. This song discusses the feelings that are unique to that first dog. In this song, we get to state very bluntly what we are often reluctant to say to those closest to us who insist on petting and playing with our dogs at inappropriate times. This song takes a whimsical look at all the little things that can go wrong, event by event and addresses those mixed emotions we sometimes have. This song expresses the emotions we feel, most of the time; capturing those moments in between the major challenges and problems. It's a sweet little love song. This song addresses the dog that doesn't work out and has to be returned to the school. This song describes the complex mental processes involved in successfully working a dog. This song discusses the emotions that come with the retirement or death of a guide dog. This song covers that time in between dogs, starting with the twinge of excitement and the novelty of using the cane and follows a progression of events that eventually lead to begging, "Somebody give me a dog!" This song takes another fun look at that time in between dogs, starting with fantasizing about that next dog working perfectly, doing something heroic, etc. It ends with a different look at some of the things that don't go quite perfectly with that new dog. This song discusses the dog that grows on you; the difficult start and that time when things really click and fall into place. This song is about that dog that just clicks immediately; that smooth start, the effortless partnership. I actually read the liner notes on the CD for the benefit of any blind or visually impaired listeners. "I have never heard the lives of blind people described this accurately in music before." It is designed to be both entertaining and educational. 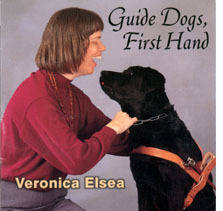 "Guide Dogs, First Hand" can be yours for $10 per CD or cassette. If you'd like to know more, feel free to download and listen to any of the short samples on this page. You'll find two versions of each song sample. Both are in mp3 format, but one gives you higher fidelity, the other gives you a faster download. Otherwise, if you haven't already seen it, find out how "We Woof You A Merry Christmas". Then you've just got to meet "The Guide Dog Glee Club"! Of course you'll want to make that appointment to check up on "Diabetes Melodious", and if you haven't already heard them, peruse the list of new songs, From The Song Banks Of Laurel Creek. Then I hope to see you on my order page. If you've never downloaded music from the internet before, and want to know what to expect, you can read all about it by following the link titled Downloading and Saving Audio Files. Then enjoy the music!